London is one of those cities that never seems to lose its historic charm despite its status as a forerunner in modernism and innovation on a global stage. From the quaint Primrose Hill neighborhood–home to posh, painted-white houses and lush public parks–to the edgy and vivacious Camden and Soho areas, or the sleek new developments scattered along the Thames, it's hard to get bored in this city. From our favorite brunch and tea spots to world class museums and incredible nightlife, keep reading for MODA's top picks in London Town! British food may immediately call to mind the likes of fish and chips, beer gardens and high tea, but the city has fast become a foodie heaven for everything else under the sun as well, with lasagna-only fast casual joints to gourmet macaroni and cheese, and alcoholic bubble tea spots. 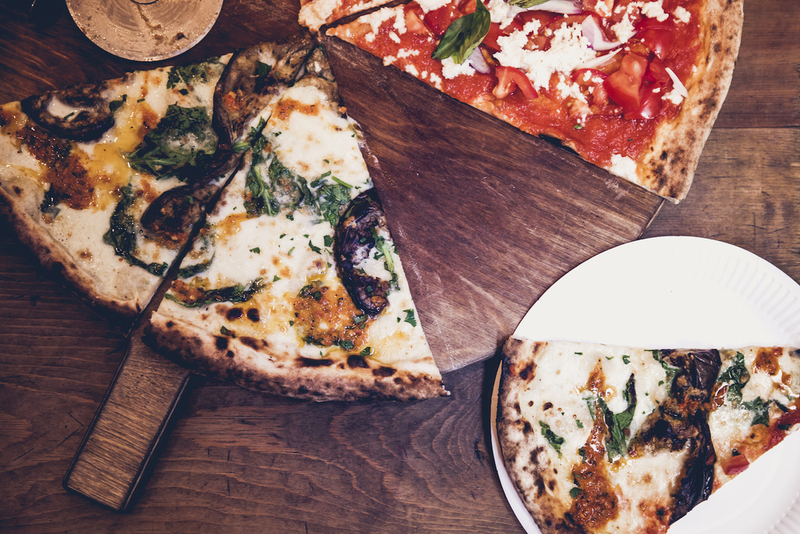 For 20 inch, mouth watering pizzas and Prosecco on tap, head over to local favorite Homeslice Pizza. This place gets busy, but is guaranteed to serve some of the best pizza you'll ever taste, so plan for long waiting times, especially if you want to dine in. For other amazing lunch options, wander through Camden Market or the chic Soho neighborhood for an endless array of restaurants, stalls and food trucks offering everything from Korean BBQ to matcha-infused soft serve ice cream. Leya's is an adorable spot for breakfast, brunch or coffee and offers staples like avocado toast, fresh squeezed orange juice and chia seed pudding. GAIL's bakery is a local chain with killer pastries, sandwiches and fresh made bread and is the perfect spot for a meal on-the-go. Alternatively, you can dress up and treat yourself to an upscale brunch with cocktails at Madison, a popular rooftop bar, lounge and restaurant with spectacular views of the city. I'd be remiss to leave out London's famed bubble tea spots. Biju prides itself on the fresh and natural ingredients it uses for everything from typical milk teas, to more adventurous "fruity milk" and "salted cream" teas. Bubbleology offers a range of options from taro and lychee, to coffee or apple jelly, as well as alcoholic bubble tea options that incorporate Kahlua, Malibu or Absolut into your favorite bubble tea flavors. There are also plenty of spots you can stop in for a traditional British high tea. The options are endless, so I would recommend checking Groupon for the best deals! London is home to a handful of world renowned museums with incomparable art collections–most of which you can visit for free! If you only have a couple days in the city, I would prioritize visits to Tate Modern for modern and contemporary mixed media art and the Victoria & Albert Museum for everything from Japanese prints to European sculpture and Art Deco jewelry. For a quick break from city life, Kensington Gardens is lovely, and a quick walk from the V&A. For panoramic views of the city and a perfect spot for picnicking, climb up the hill in Regents Park. Don't forget to stroll along Thames River for views of the Big Ben, London Eye, Parliament, Globe Theater, St. Paul's Cathedral, National Theatre, and many more famous sites! 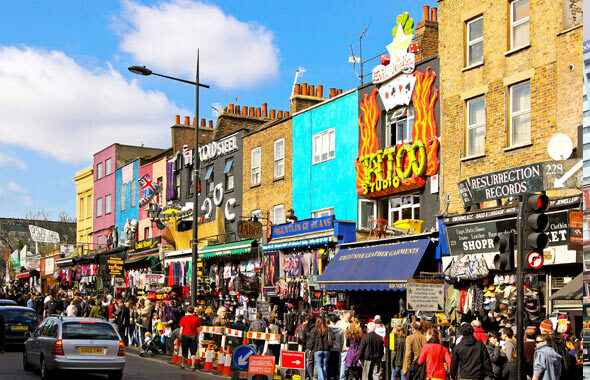 Camden borough is the perfect spot for everything from £15 piercings to touristy, London-themed paraphernalia and souvenirs. If this isn't quite your cup of tea, turn off into Camden Market for a more curated shopping experience. If you're on the hunt for handmade jewelry, vintage clothing or discovering knickknacks you never knew you needed, this is a really fun area to explore. There are also tons of food stalls, food trucks, pubs and coffeeshops nestled throughout the market in case you need a break from shopping. While major department stores like Harrods and Selfridges are quintessential destinations for some of the best (and priciest) shopping in the city, the bustling Soho neighborhood is perfect if you're looking for boutique shopping, locally owned stores, vintage and a couple of well-known brands. For great cocktails that fetch for decent prices and a cool, hole-in-the-wall vibe, Freud's Bar is the perfect place to grab drinks with friends after dinner or before a night out. For a slightly rowdier scene, head over to the London Cocktail Club for fun drinks, popular music and bartenders that are prone to dancing on the bar when certain songs come on. Finally, the Ministry of Sound is one of the oldest and most well-known clubs in the city. The venue regularly draws top music acts and crowds by the thousands. Be sure to purchase tickets on their site in advance! In the city for more than just a couple days? Check out our comprehensive guide to all things London here!